The Lord-Lieutenant’s Cadet, 17 year old Kieran Stevenson from Sandy, was delighted to be part of the Royal Visit to Bedfordshire by HM The Queen and HRH The Duke of Edinburgh on Tuesday 11 April. Kieran was appointed for a one year term of office in October 2016. Since joining the Bedfordshire Fire Cadets in 2013, he has been active in community work and has achieved the role of junior instructor. He is also working on his Duke of Edinburgh Gold Award and studying for his A levels. 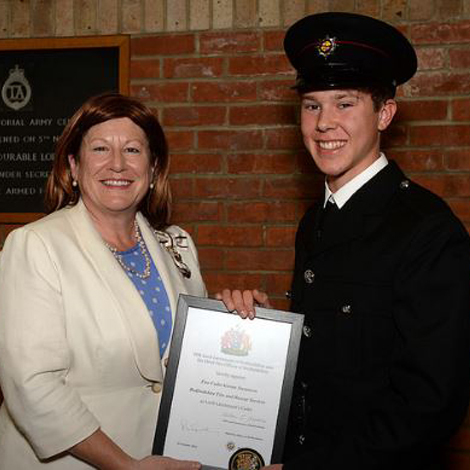 Kieran is the third fire cadet to represent the Lord-Lieutenant. This year, the Lord-Lieutenant has four cadets who represent fire, sea, air and armed forces. All four cadets support her on royal visits, honours receptions and civic ceremonies across the county. HM Lord-Lieutenant of Bedfordshire said "The decision to include Fire Cadets in my Lord-Lieutenant's Cadet appointments has been a huge success. The three young people who have held the position to date have proved to be confident, capable, reliable and have all gained the respect of the variety of royal, civic, charity and business people with whom they have engaged while supporting me in my role. The Fire Cadet movement has much to offer young people. It gives the opportunity to learn life skills while having a lot of fun!" Chief Fire Officer Paul Fuller said “We are the first Fire and Rescue Service to have a Lord-Lieutenant’s cadet and it is a tremendous opportunity for the young person chosen and for relationship building for the Service. We are of course hugely grateful to the Lord-Lieutenant for her ongoing support”.